The best care that I have received. I suffer from severe arthritis and this is the only thing that helps as I won’t take narcotic drugs for pain and all other medicine’s have not helped. My visit with Dr. Cramer was extremely pleasant, professional, and personal. He took the time he needed to catch up on my history, and listened to me as to how I was feeling. He talked me through the process and adjustment and provided any instructions for me to follow up! I couldn’t have been more pleased with my visit! Within the first visit with him, I knew this was a great find for me! It was a wonderful experience, beginning at the moment I walked into the door! Thanks to all of you! 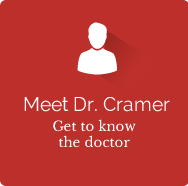 Dr. Cramer is very knowledgeable and great with people. He’s a good listener and explains things fully.